Preheat oven to 375 degrees. Place two sheets of paper towel on a microwave safe plate. Place half of your bacon on top of the paper towel (absorbs the grease) then more paper towel on top of the bacon. Microwave for 5-6 minutes. Bacon must be crisp, not chewy. Repeat with remaining strips and set aside to cool. Mix room temperature butter and egg until combined, then add chocolate chunk cookie mix. Knead with hands if necessary. Rough chop your bacon strips. 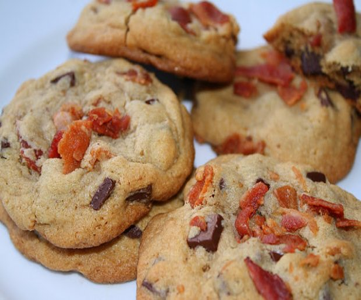 Mix bacon into cookie dough. Roll about two tablespoons (or one for smaller cookies) into balls, (no need to make them perfect), and place them on an ungreased cookie sheet. Bake for 12-15 minutes or until just golden around the edges. Cool before removing from the cookie sheet. Eat one and then give them away immediately.